Promotional flyers are a cheap way to promote your business or startup company. 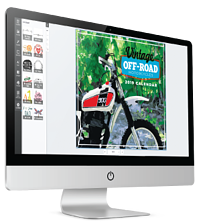 Online color flyer printing and mailing is a cost effective way to get great promotional results. Business promotional flyer printing is affordable to print and quick to deliver! Flyers can be passed out on the street, inserted in packets, included in shipments or mailed directly. Make sure you clearly direct your audience where you want them to go. A simple design that visually emphasizes your main point and copy that is short and persuasive will give you the best results. There should only be one main point on a flyer with supporting visual images. These elements paired with the right offer help to get great results from your promotional efforts. The same concept applies if you are promoting a product or an event. Don't overcrowd or overwhelm, keep it simple and make a big statement. The most important elements are date, time, location – so make sure these are stated clearly. The size and options available for business promotional flyers make them an affordable and effective way to reach your audience. They are easy to customize and personalize for any company or firm. Flyers can help to strategically position yourself within your market. Business promotional flyers are an indispensable business tool used to make a quick statement. They’re easy to distribute and help you to increase public visibility. Discount flyer printing, free online design and effective print marketing strategies help startup companies reach highly valuable local and national audiences. Generating awareness and building a solid customer base are two of the biggest challenges of any startup business. One of the most effective strategies to accomplishing both of these goals - without stretching the budget too thin - is flyer printing. Flyer printing comes with another added benefit as well – cost-efficiency. Printing color flyers in bulk will help the sponsoring company save even more money on production. Flyer printing is perfect for startup businesses to reach highly valuable local audiences. Our color flyer printing company is one of the few online flyer printers that can offer discount flyer printing on orders fewer than 10,000 pieces, which is ideal for new businesses. Entrepreneurs should target locations with a lot of foot traffic, such as grocery stores, banks, shopping malls or college campuses. It's important to be courteous, though, and entrepreneurs should only pass out flyers where it is allowed. The most effective color flyer printing will be vibrant and eye-catching. Whether organizations put flyers on display, have someone handing them out or are sending them via mail, they need to be appealing to attract attention. Designers may generate the most interest using a combination of bright colors and interesting images. These locations enable startup companies to get in front of hundreds or even thousands of potential customers daily. 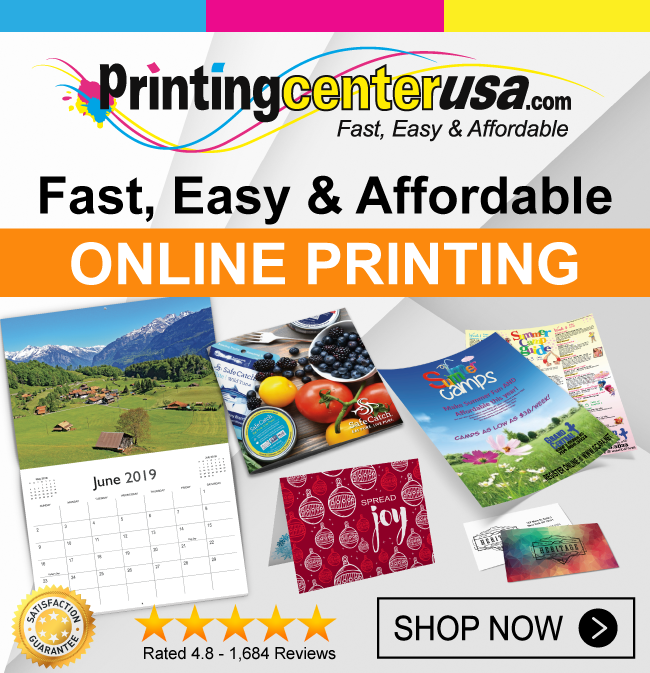 When you order flyers from PrintingCenterUSA, you don’t have to leave your desk, simply enter your flyer printing specifications, upload your files, and submit your order. Our printing shop will do the rest! Business cards are portable, versatile, inexpensive, and resourceful. A well-designed printed card is perfect for networking, including in an informational packet, or attached to products for reordering or contact information. 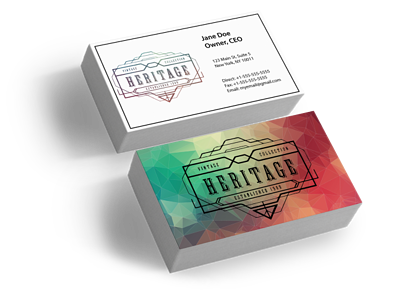 Never underestimate the power of a well thought out business card that is professionally printed using full color commercial printing. Your business card represents you and your company, be sure it is perfect! Follow the tips below to assist you in designing great cards with ease. With business cards, you have such a small space that you don’t want to over design. Keep it simple and clear. 2. Use the Back of the Card for Eye-Catching Imagery. This is where you want to draw in your customers. The back of the card is a great place for a large version of your logo, an eye-catching image, or both! 3. Use the Front of the Card for Important Information. 4. Design Your Correspondence Pieces to be Similar. 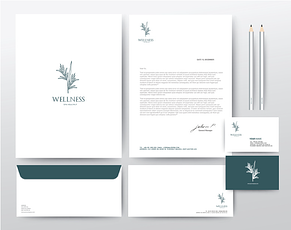 Be sure that your business cards, letterhead, envelopes, presentation folders and all stationary items have a consistent look and feel use similar colors that work well together. 5. Use Our Templates to Help With the Layout. By using our free templates, you will be less likely to have layout issues like including bleeds, safe zones, and trim area. Keep in mind that if you do not specifically request a proof at checkout, we will not provide one. If there are issues with the files that make it unable to print, we will reach out to you and have you make corrections to the file. 6. Take Advantage of Full Color Printing. Full color printing is less expensive than two color when you order with PrintingCenterUSA and the quality will impress your customers. 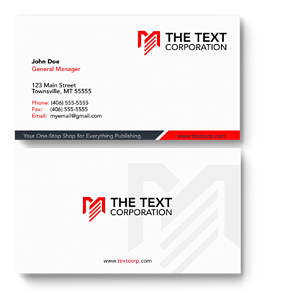 The standard business card size is 3.5” x 2” (3.75" x 2.25" with bleed) and the best quality at PrintingCenterUSA is 4/4 full color ink on 14pt gloss cover paper. 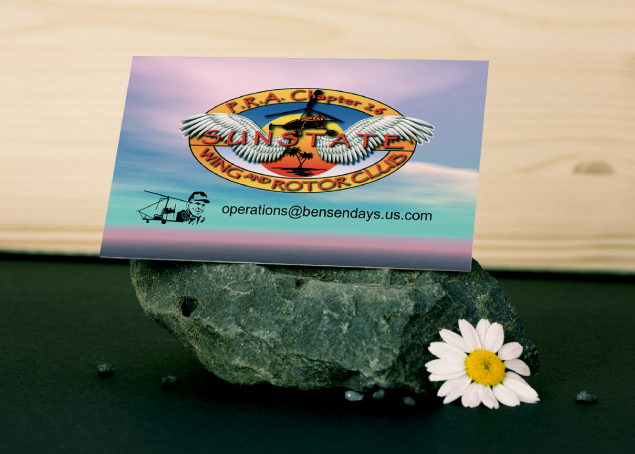 You can also get UV coating on the full color sides to make your card look even more eye-catching. 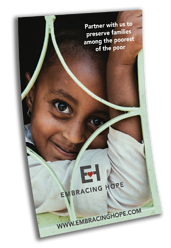 Helping churches and religious organizations nationwide find easy and affordable outreach church printing solutions is important to us at PrintingCenterUSA. 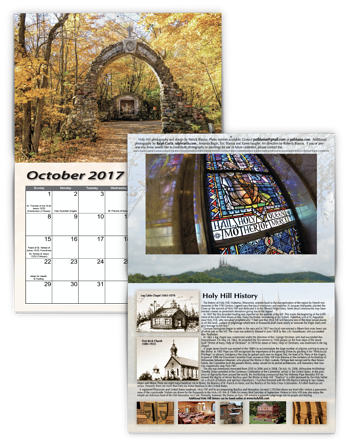 Want to get started on a church directory, calendar or holiday card? We have the design resources you need with fast services and a satisfaction guarantee. We help leaders of all faiths with their directory, calendar, brochure, booklet and monthly newsletter printing needs. We are one of the few online printing services that offer cheap printing prices and high quality products for quantities between ten and 10,000. Outreach color brochures, booklets and monthly newsletters can act as a communication tool for existing members, informing them of upcoming events, such as charity drives and potluck dinners. 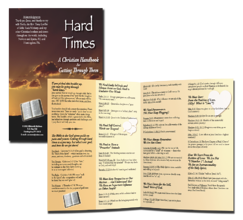 Religious printing projects could be sent to provide even more insight on current happenings in the church community, can also be used to keep in touch with the congregation, or used to reach members that haven't attended service. 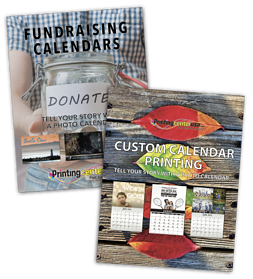 If your organization leaders are willing to make the effort, they can develop extremely profitable fundraiser calendars to help support church programs and to remind members of their faith year round. 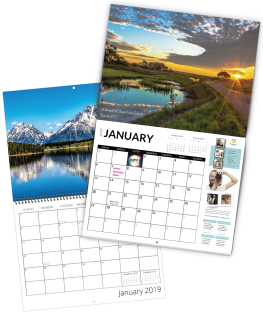 We have free calendar templates and grids to help you get started using the Adobe Creative Suite or a free photo calendar designer where all you have to do is upload your photos, drag and drop them in to place, customize the monthly grids and we’ll do the rest. 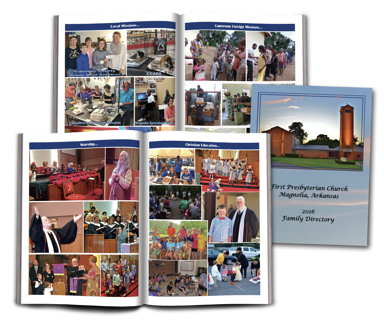 Membership directories are a great way for new and current members to meet and get to know by names and photos all the leaders, trusties and their fellow church members, contact information, church history, activities, etc. 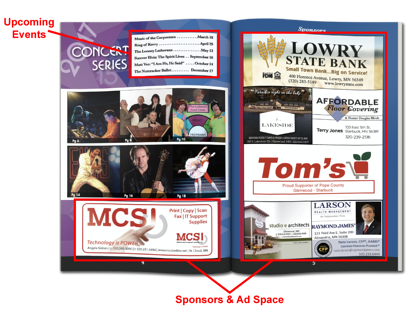 Advertising may be sold exclusively to members or any business in the community to pay for the cost of the directory. 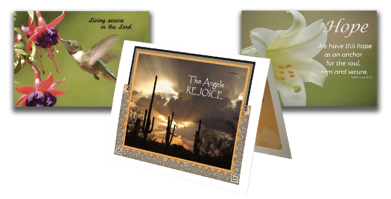 Many churches and religious organizations are using greeting cards for fundraising purposes. 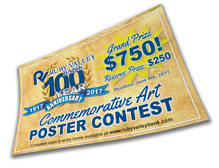 They have relatively low production costs, enabling churches to print and sell or raffle them for a considerable amount of revenue. Color brochures requesting donations could also be sent to members. As your printing partner, we work with you to save you time and money by providing you with great quality products at an affordable price. Don't believe us? Request a sample packet to see and feel the product for yourself. You can get an online to feel secure that you are getting a fair deal or . If you have any questions or you need help with your order, call and speak with one of our customer service representatives. 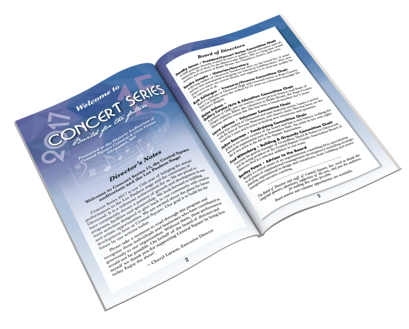 Event programs for entertainment events such as art exhibits, theatre, music, cinema, concerts and plays should contain information people attending need to know to keep your event running smoothly. 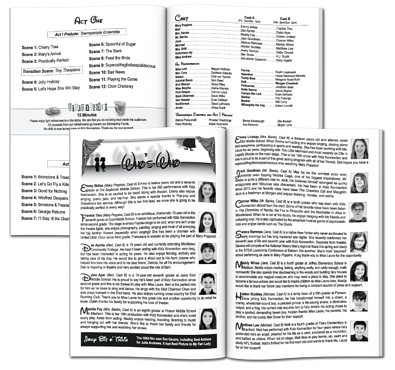 Programs also help your attendees keep track on what's happening during the event. You and your fellow program developers can take current digital pictures, gather digital pictures and/or have fellow students, associates or crew gather pictures that will help enhance your program. Individuals, groups, cast, crew, participants, directors, speakers, special guests, etc. Photos from past events and activities, practices, gatherings, trips, etc. Other events, places or things that relate to your event or organization. Points of interest such as people or landmarks from your organization, community or events. Whether it be a director's note (like the example on the right) or a welcome page, you will want to welcome attendees to the event, give them any needed information about the event and wish them all the best and that hope they have a great time. Spotlight and provide thanks to participants, speakers, entertainment, special guests, and other worthy parties. Express thanks to anyone who provided promotional items, donated funds or did volunteer work for your event. Have a page with information about your event, organization, milestones and mission. If you are asking for donations, add in the address or website where they can send their donations. You may also want to include a map of where your located or special notes about your gatherings and/or organization. Showcase your participants and staff who have worked so hard to make this event happen. You can even include statements from each on why they love being part of your event or organization, as shown under "Who's Who" in the example on the right. Contact friends, clients, past performers and guests and ask them to write a short paragraph on your past events. This could be anything from how they felt while watching the event or why the participants liked working with the people behind the scenes. Be sure to include a calendar or schedule with all your upcoming events so that people attending can know what to look forward to. If you are selling memorabilia, add in a page showing off what is available for purchase and where they can purchase the items. 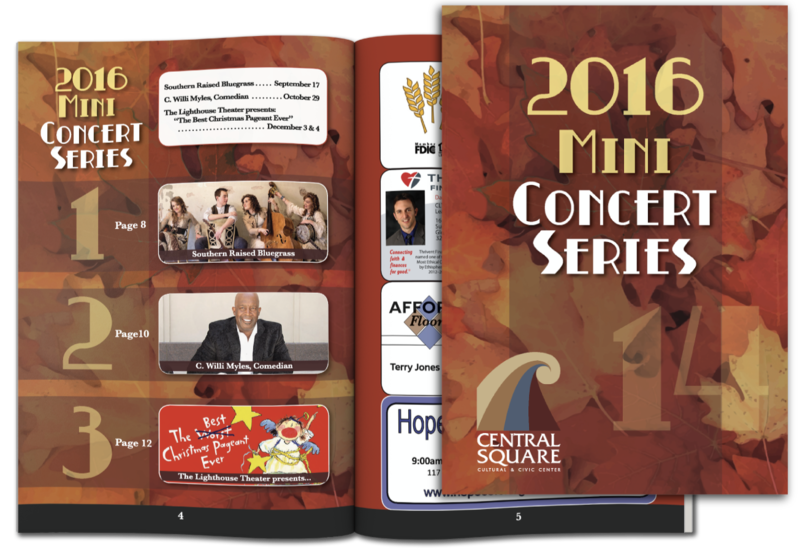 Programs are saddle-stitched booklets, meaning that page counts have to be divisible by 4 (8, 12, 16, 20 and so on). If you are short on pages, the following types of pages make great filler pages to help make your program have the right number of pages. The front cover starts at page 1. The inside front cover is page 2. The inside pages continue like the diagram below for pages 3, 4, 5 and 6. The inside back cover will be page 7 and the back cover will be Page 8, depending on the page count. So if we did an 8 page program, it would be like the 8 page sample shown below, which includes the cover. Covers can be printed on cover weight paper or you can use the same weight as the interior pages, which is called a self-cover. Now that you've ready our guide, let's make this year's event program the best one yet. It all boils down to organization and choosing the right printer. With PrintingCenterUSA you get exceptional customer service and printing experts. We can get the job done with a professional quality that won't break the bank. That's a secret we don't want to stay quiet! We have affordable prices for all of your printing needs. So go ahead- spread the word!